The Sound of Color cd features the artwork of Charles H. Denault Studio along with short stories written by John Sloan. Designed as "coffee table book" idea, the Sound of Color captures the essence of the artwork to stories. 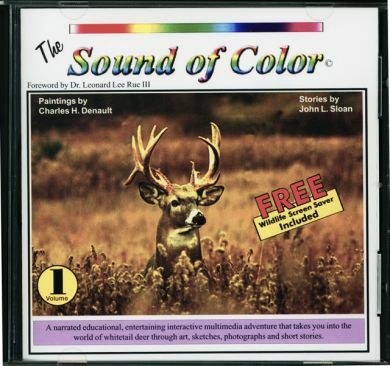 Along with many other features such as interactive story boards for children and the exclusive Charles H. Denault Screen saver, The Sound of Color CD- rom is a keep sake for all ages. Due to package laws and such, the Sound of Color once open cannot be returned. Regulary sold for $29.99, the Charles H Denault Studio is offering this rare software collection for $10.00. It is designed to work with Windows 98,2000 and XP. We are in the process of testing it in Windows 7. The Sound of Color makes a great Christmas Gift. This was a limited run and only about 1000 are left. SHIPPING IS $2.90 for up to 4.